This is a perfect application for the Kitt-A-Watt meter! It’s a simple device that plugs into any standard 120v outlet that you plug your 120v appliance into, such as your microwave oven, and then read the power consumption right there on the digital display. Sounds expensive but it’s not! 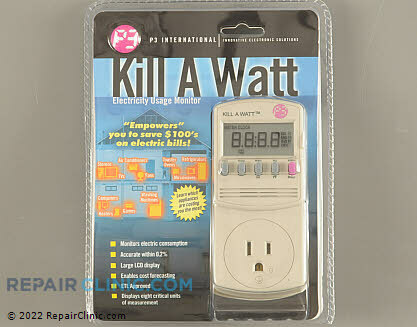 The Kill-A-Watt meter is less than $30 and comes with a one year warranty if purchased right here. To learn more about your microwave oven, or to order parts, click here. This entry was posted in General Appliance Wisdom, Microwave Ovens on March 14, 2013 by Samurai Appliance Repair Man. Join Samurai Appliance Repair Man on this exclusive guided tour through the Guru Mobile– the fixit vehicle that he does real-life appliance repair service calls in. This entry was posted in General Appliance Wisdom, Samurai Incarnate on March 3, 2013 by Samurai Appliance Repair Man. The bake element on my oven completely fried. Got a new one, installed it, turned it on.flash! sizzle! SMOKE! turned it off and went to meditate on the need for an oven. Took the back off the stove (several days later, mediation takes time) and found the yellow wire going to the thermostat completely fried off. Once again contemplated the need for baked food. Can this be fixed (30 year old unit)? Should it? Is raw food really better for you anyway? This entry was posted in Appliance Repair Radio, Podcast, Range Repair on February 21, 2013 by Samurai Appliance Repair Man. A common problem with refrigerators is the appearance of various forms of water in places where it shouldn’t be. Examples are: water at the bottom of the freezer and dribbling out the door in a side by side refrigerator; fuzzy frost built up on the back wall inside the freezer compartment; moisture on beer bottles and the side walls inside the refrigerator compartment (also called the Beer Compartment); solid slab of ice on the bottom of the freezer compartment. In each of these examples, we’re dealing with water that’s out of place. Water in a refrigerated space can take on three forms: ice, frost, and condensation. Which of these forms you see, along with where you see it, are important clues to help you zero in on the needed repair. Condensation problems will appear as “sweating” on jars and bottles and sometimes even on the sidewall in the refrigerator compartment. Condensation is caused by water vapor condensing into a liquid as it hits the cold surfaces inside the refrigerator. When you see this, it means outside, humid air is getting inside the refrigerated compartments when and where it shouldn’t. So, you’re looking for bad gaskets, doors not closing properly, or doors being left open from carelessness. Ice refers to liquid water that froze into a solid. This sounds obvious but it’s an important distinction from frost, also known as rime ice, that fuzzy looking stuff that is formed when water vapor condenses directly into a solid. The important point here is that ice and frost are the effects of two completely different underlying causes. If you see smooth or solid ice in a freezer, then you know you’re really looking for liquid water in places where it shouldn’t be (that ended up freezing): clogged condensate drain in the drip trough below the evaporator coil; ice maker fill tube leaking or out of place; ice maker mold leaking. A special (but common) case for diagnosing frost in a freezer is when you see frost accumulated on the evaporator coil or back wall inside the freezer that covers the evaporator coil. 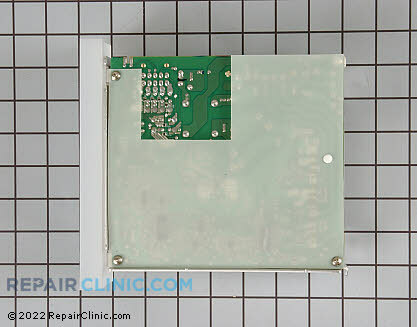 This indicates a defrost system failure (defrost terminator stuck open, burned out defrost heater, bad defrost timer (on older units) or adaptive defrost control (ADC) board). The reason rime ice forms on the evaporator coil in the first place is because the coil operates at a temperature of -20F. At that temperature, water vapor that contacts the coil will condense and freeze directly into a solid, forming rime ice. Every few hours the defrost system should kick in and melt that ice, because if it’s allowed to accumulate it will eventually act as an insulator, preventing the air from contacting the evaporator coils and getting cold. The resulting problem would first be seen as a warm refrigerator compartment and, if allowed to continue, eventually the freezer will also get warmer than normal (normal = 0F). Rime ice accumulated on the inside of the back wall in the freezer will often be seen at this point. This melted rime ice has a special name: condensate. (Not to be confused with condensation, although the words are similar, they arise from two different causes.) Condensate refers to the water that gets melted off the evaporator coil in the freezer compartment during the defrost cycle. This condensate drips onto the condensate drip trough below the evaporator coil and drains out the condensate drain– a hole in the condensate drip trough– through a tube to the drain pan placed down by the compressor where it eventually evaporates due to the combined action of the compressor heat and condenser fan motor. This entry was posted in Refrigerator Repair on December 8, 2012 by Samurai Appliance Repair Man. As the temperatures drop, folks all around the country are firing up their furnaces to keep out the cold. This issue of Appliantology offers you some tips for keeping your furnace running at peak efficiency and some resources for repair help and parts in case your furnace breaks. This is the single most important and easiest thing you can do to keep your furnace running right. 1. Prolong the life of your furnace. Air filters prolong the life of your furnace by keeping harmful particles out of the blower motor and heat exchanger. The blower motor can burn out if not kept clean and costs more than $200 to replace. Additionally, by not changing your filters every month, you can do the same damage to your unit’s motor by restricting the airflow needed to prevent the motor from being overworked. Considering the potential costs of repairs, filters are very inexpensive. 2. Cut down on your energy cost. The second reason for changing your air filters regularly is to cut down on your energy cost. A dirty air filter can increase your energy cost by 35% by causing the furnace to work harder and run longer to maintain the desired temperature. 3. Promote better air quality in your home. The third reason to change your air filters regularly and upgrade to a higher-grade filter is that it promotes better air quality in your home. Replacing your filter on a regular basis will cut down on airborne particles that can aggravate allergies and carry viruses. Typically, air filters are rated by the size of the particles they can remove. Most good furnace filters can easily remove particles larger than 10 microns in size, but the best filters are able to remove particles smaller than 3 microns. One micron is one millionth of a meter or approximately 1/25,000 of an inch. For comparison, a human hair is about 70 microns thick. Most pleated filters have a performance rating that is assigned a number to indicate the level of effectiveness. Generally the higher this number is, the higher the performance of the filter. Different manufacturers use different performance ratings but 3M’s MPR rating is emerging as the industry standard. MPR stands for Micro-particle Performance Rating. The 3M MPR rating focuses on the smallest and most troublesome particles – those between 0.3 and 1.0 Microns in size. Generally speaking, a filter with an MPR of 1000 is twice as effective at removing those tiny particles as a filter with a 500 MPR. The flat panel fiberglass filter, such as this one, is the lowest cost filter available under $1.50 retail each. This is the least effective filter in terms of particle filtration, but is good for protecting equipment if changed regularly. Flat panel filters are designed to catch only larger particles, allowing smaller particles to pass through. Flat panel filters have no performance rating due to their low efficiency. The recommendation is to replace flat panel filters every 30 days. The second type of filter is the basic pleated filter like this 3M 300 Dust Reducing filter. Compared to flat panel filters, the pleated filter is 5 times more effective in catching the airborne particles than flat panel filters allow to pass through. The retail for a basic pleated filter is under $5.00 each. Because they catch smaller particles, they are more efficient than fiberglass filters. They reduce energy costs by keeping your unit cleaner, as well as keeping your air quality at a higher standard. Basic pleated filters, based on testing of residential systems, need to be replaced every 30 days. The MPR rating on basic pleated filters ranges from 300 to 500. The best type of filter we will discuss is the electrostatic pleated filter like this 3M 600 Dust and Pollen reducing filter or this 3M 1000 Micro Allergen filter all the way up to 3M’s top-of-the-line 2200 Elite Allergen Reduction filter. Electrostatic filters have media that is charged with electric current during the manufacturing process, allowing the filter to attract smaller particles; much like a magnet attracts metal. 3M electrostatic filters have both positive & negative charges to attract dust no matter which charge it holds. Electrostatic filters are up to 18 times more effective than flat panel filters and have MPR rating of 600 to 2200. The average retail on this type of filter is from $7.86 to $ 10.96 each. These filters are designed to be replaced every 90 days. Considering the lifespan of these electrostatic filters, they not only do a better job of cleaning the air in your home but the cost less on a monthly basis because they don’t have to be changed as often. Broken Furnace? Get Repair Help! If your furnace does stop running or isn’t running right, come get interactive repair help in the HVAC Forum at the Appliantology Academy. Our friends at RepairClinic.com, the premiere online source for appliance parts, now offer furnace parts for Carrier, Lennox, and York with the same awesome, hassle-free one-year return policy that they offer on appliance parts! To shop for furnace parts, click here. This entry was posted in Appliance News on November 15, 2012 by Samurai Appliance Repair Man. In this special issue of Appliantology, I’ll reveal some of my personal, favorite SWATs that I use on some service calls which can also be useful for amateur appliantologists working on their own appliances. Good for all kinds of household tasks such as cleaning and disinfecting, the mighty hand-held steamer is indispensable for some appliance repairs. For example, defrosting a frosted-up evaporator coil or clearing a clogged condensate drain in a refrigerator. In fact, since I’ve been using my steamer, I can’t imagine doing these types of repairs without it! It’s makes quick work of these messy jobs. Take a look at the icy mess in the freezer in this video; this repair would have taken over two hours without a steamer but, with the steamer, I did this entire repair in less than an hour! 1. Customer complains of warm temperatures in the beer compartment of her Maytag side-by-side refrigerator but says that the freezer compartment is fine (and we know how accurate customer temperature measurements are… NOT!). You arrive and measure the freezer temperature using your infrared temperature gun and get readings that vary from +5F to +12F. Marginal temperatures for a freezer but was that because it was just coming out of a defrost or off-cycle? Was the door recently opened just before you got there? You don’t know, and all you have is the one data point: the measurement you just made. Wouldn’t it help your diagnosis if you could put a data logger inside the freezer for a day or so and then look at a graph of the actual temperature measurements inside that freezer over time? 2. Customer complains that the freezer temperature in her GE built-in refrigerator fluctuates over time from 5F to 10F to 20F and then back to hard freeze. You maybe even verified this yourself (if you spent enough time there to do this). But how much time in a typical service call day do you have to babysit freezer temperatures? And you still wouldn’t be able to gather enough temperature-time data points to discern whether or not there’s a pattern to the fluctuations which could then be correlated to some other process in the refrigerator (defrost cycles, compressor cycles, etc.). Even seeing that there is no pattern, that the fluctuations are random, is also helpful because it could indicate something as simple as the door not being closed all the way (hinge adjustment issue?). You probably know how to use a multimeter to make simple electrical measurements, like voltage and resistance. (If not, then see this page at my blog for a simple tutorial on using a multimeter: http://fixitnow.com/wp/2004/12/18/appliance-repair-revelation-making-basic-electrical-measurements/ ) But sometimes, you have to do a voltage test in an unusual way to check whether a component is good or bad. A common example of this is testing the high voltage rectifier (also called a diode) in a microwave oven. This is an inexpensive, common-fail part that will stop the microwave from heating if it breaks. One of the common failures with a refrigerator compressor is that the varnish insulation on the motor windings starts to break down and then begins leaking current to ground. If the current leakage is large enough, you can deduce that this is happening by measuring compressor current draw– an abnormally high reading combined with the compressor running hotter than normal are sure signs that the insulation on the compressor motor windings is breaking down and the compressor is not long for this world. Measuring current flow through a circuit or component is a powerful troubleshooting tool to have in your appliance repair SWAT bag. For example, on a Bosch dishwasher that’s not heating, a quick current measurement a few minutes into the cycle will tell you whether or not current is flowing through the heater. If not, yet the control board is supplying 120 volts to the heater circuit, then you know the problem lies in the heating circuit itself because something in that circuit (heater, NTC, etc.) is open, stopping current flow. No harm in buying and trying with our 365-day, no-hassle return policy, even on electrical parts that were installed! And now shipping to Canada, too! This entry was posted in Appliance News, General Appliance Wisdom, Repair Video on October 19, 2012 by Samurai Appliance Repair Man.